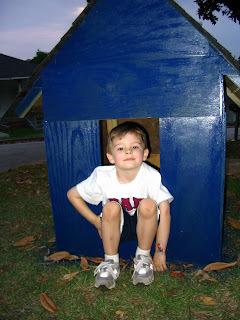 Several months ago Laura and William built a doghouse for Sammy. They did a great job! 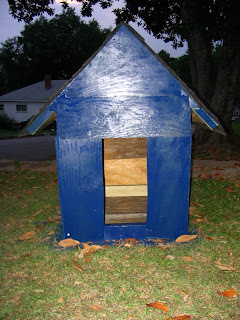 Here are some pictures of the fruits of their labor, along with the builders themselves. Last Saturday Lorelai and I had a play date with my friend Jamie and her son Landon, who will be 1 in September. We went to a park in Greer and although it was very crowded and hot, we still had a great time. Waiting to head out for our day of fun. She was wearing sparkly jeans from Aunt Diane. They were adorable! Wanted to take a picture of her whole outfit since she was wearing shoes, which is a rare occurrence, and she looked so grown-up. Still somehow managed to cut her feet off. Go figure! Wanted her to wear a hat so that her head wouldn't burn. She wore it in the house, but that's about it. Dan took this picture while I was getting her bag together. She was watching me which is why her focus was pulled. Calling Jamie to find out if they're on their way. Finally, a picture with the shoes!! Caught making a fish face. Her new thing is to blow fish kisses. It's precious! Introducing Landon! Isn't he handsome?! I just love this picture because he looks so cute just hanging out with his ankles crossed. My friend Jamie. She's always sporting a huge smile. Of course when you try to get two one-year-olds to look at one camera they immediately look at the other one. Jamie was on the other side of me doing what we moms do best-taking pictures! Chilling out on the springy toys. Trying to stand up on the foot rest. Cookie Monster! This is a picture Jamie took of Lorelai after we all sat in the shade to take a snack break. Lorelai had been eating a 100-calorie pack of Chips Ahoy! cookies and ended up with chocolate on her face. Lately Lorelai has taken to being very "vocal." Since she's not really saying any words with the exception of "Dada" she expresses herself by making lots of noises. I was able to catch one of her great expressions over the weekend while we were all playing outside. She looks angry but I guess she was just very passionate about whatever she was trying to "say." My mom used to take a picture of Craig and me each year on the first day of school on our front porch. Now it's William's turn to follow in his dad's footsteps. Here he is on his first day of preschool sporting his backpack and "Cars" lunchbox. Let the learning begin! 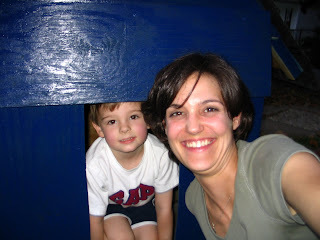 Here are some pictures Lisa sent via e-mail of her photogenic brood. It's amazing how much Chase has changed in just 4 days. I think he looks just like his dad. The happy trio enjoying the cooler weather. Chase looks very content with his new family. It's amazing how much lighter Sierra's hair looks in the natural sunlight! On Thursday, August 21, Lisa gave birth to a beautiful baby boy named Chase Robert. Lorelai, Dan, and I went to see the newest addition to the Jacob family on Friday evening. Here are some pictures of our visit. Resting peacefully. Just like my cousin Sarah, Lisa looks radiant after just having a baby. Again, I am so jealous!!! Why is it that after I had Lorelai I looked like I had been awake for one straight week and these ladies look like they've been at the spa?! :) Uncle Rob looking quizzical. Rob entertaining two of his favorite little ladies. Sierra looks like she's channeling Carol Burnett and her trademark ear tug. This zebra was given to Lorelai by one of Dan's co-workers for her birthday. Sierra seemed to enjoy it, too. Trying to juggle two kiddos. Lorelai was being very squirmy. Sierra and "brother Chase," as she calls him. A close-up of Chase from the previous picture. I thought the way he had his hands on his face was precious. Taking a "self-portrait" of two people is fairly simple, especially when those two people are adults and will hold still while it's being taken. On the other hand, when you have three people to be photographed and one happens to busy a very active one-year-old, the task at hand becomes much trickier. While at Swoozie's I tried to get a group shot of Lorelai, Thea Caro, and me. I decided to post both of the pictures that I took since I couldn't get a picture with all three of us in it without cutting off someone's head. Lorelai is getting so much better at leaving hats and other such head wear on. When we went to Swoozie's on Tuesday night she was willing to let me put the titled items on her head for much longer than anticipated. Here she is in all her glory. While I'm not a huge fan of bows on babies, particluarly when they have minimal hair like my little one, I must admit this picture is absolutely adorable!! On Friday, August 8, my cousin Sarah gave birth to a beautiful baby girl named Elizabeth. Sarah and her husband, G, also have a gorgeous 4-year-old daughter named Grace. Here are some pictures of these lovely ladies. What a beautiful little angel. Flashback to Father's Day 2008. Lorelai and Sierra were busy fine-tuning their cheerleading technique. While Sierra has had lots of time to perfect her "High-V," Lorelai gave her cheering skills her best effort. Found this option on the website where I procure most of my cute backgrounds and thought I'd give it a whirl. Several weeks ago Sierra came to church with Ma and Pap. After Mass we all went out to dinner. Lorelai and Sierra had a fabulous time playing with Pap and bouncing on his lap. Here's a video capturing their bouncing fun.